Start PowerPoint and create a new Blank presentation. 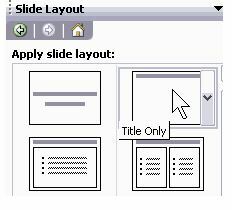 Insert a new slide with the Title Only layout. Type in your question in the Title placeholder (add graphic to the slide using the Insert | Picture | From File… option if you want one included in the question). Now add three or more text-boxes beneath the picture and type in the answers. Only one of the answers needs to be correct. Format the text boxes with fills if required. 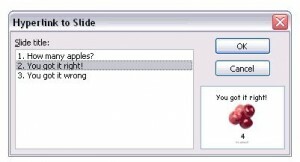 Now go back to the question slide and select the text box that contains the correct answer – be careful to select the text box and not the text itself. Use Insert tab –> Action Settings option. 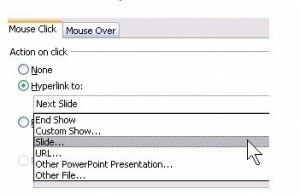 In the “Mouse Click” tab of the Action Settings dialog box, activate the drop down box in the “Hyperlink to” area and choose the “Slide…” option. In the resultant dialog box, choose to hyperlink to the “correct” answer slide. 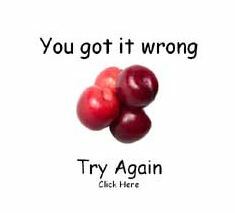 In the same way, hyperlink the text boxes with the wrong answers to the “incorrect” answer slide. 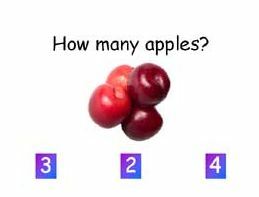 Create four similar sets of three slides each with the four remaining questions. 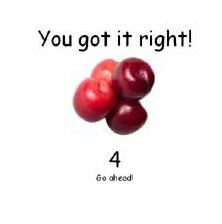 On all the “incorrect” answer slides, provide a link back to the actual question slide so that users can attempt to answer the question again. 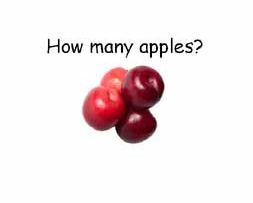 On all the “correct” answer slides, provide a link to the next question.